Timberline offers over 21 downhill, hand-built natural trails with a variety of challenging features. Timberline Four Seasons Resort has some great family-friendly mountain biking trails. 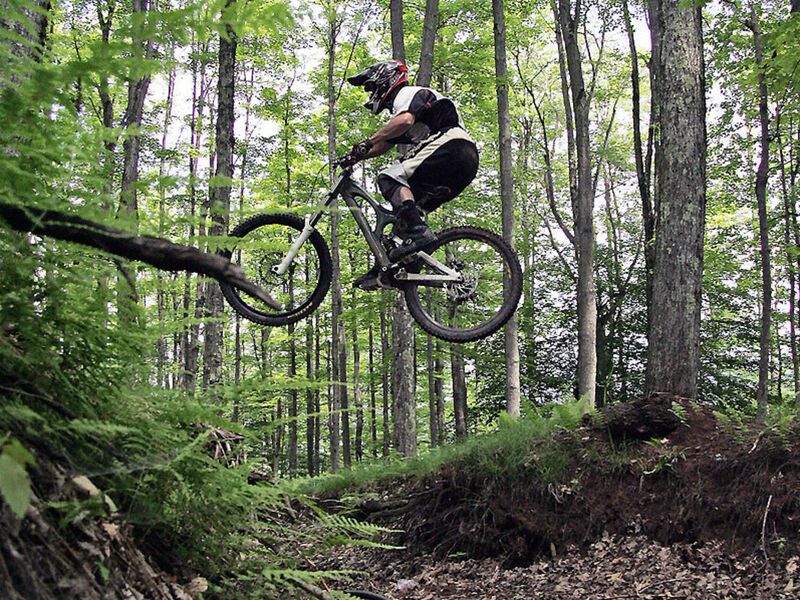 The wooded mountain biking areas at Timberline have around 10 miles of gentle riding, while the Bike Park's 21 trails cover about 3 miles. Difficulty ratings at Timberline Four Seasons Resort range from gentle and beginner-friendly biking to challenging intermediate and expert downhill trails. If you're short on time and looking for a quick workout, you can certainly get in some good riding in an hour or two, but you’ll definitely want to spend all day at the park if possible. The Timberline Bike Park typically opens in late spring and closes in the fall when the weather gets colder and it snows. Ticket prices for the bike park range from a full-day around $25 to a single-ride pass under $10. Season passes can be obtained for $150 and bike rentals are $20 per day or $10 per hour. Timberline Four Seasons Resort is in the scenic high mountains of Tucker County, West Virginia. The resort is well known for its exceptional ski slopes, but it is also open in the summer with activities like zip lining, horseback riding, hiking and (of course) mountain biking. 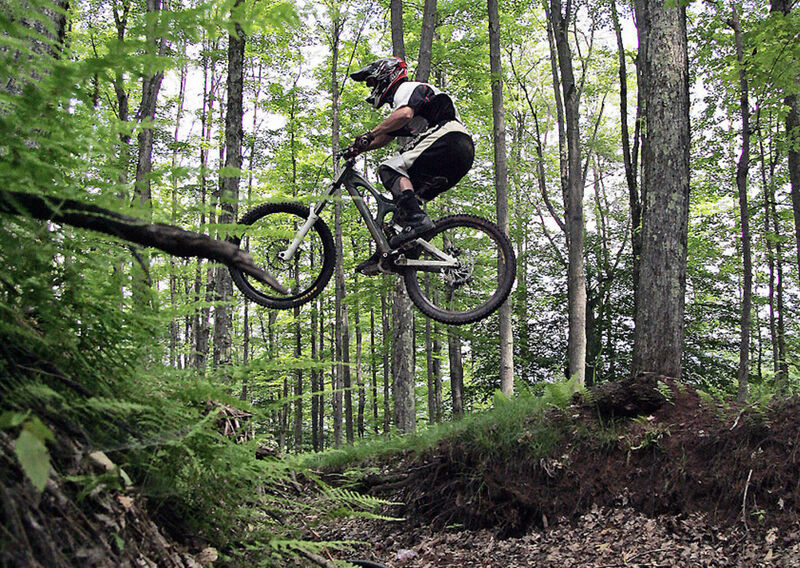 The Timberline Bike Park has a variety of downhill, cross country, and pump tracks. The majority of the trails are handbuilt on the natural terrain, and the park is not machine groomed. Timberline Bike Park has uncrowded lift access to stellar riding. The Bike Park has it all— hits, berms, gaps, bridges, and more— for downhill gravity biking on 21 hand-built singletrack trails, with 1000 vertical feet of drops. These challenging trails test your limits, since the natural terrain changes every few feet. The trails in the bike park are designed for intermediates and expert bikers, and unlike machine-groomed parks, these trails are built to be rugged. The resort has uncrowded lift access for bikers, so you can relax and soak in the scenery instead of having to lug your bike up the mountain. The resort also has more than 10 miles of gentle, wooded cross-country terrain for more beginner-level biking, which are great for the whole family. Bikers of all experience levels will find something at Timberline. Beginners or casual bikers will love the gentle 10 miles of wooded cross-country biking. Photographers and nature-lovers will particularly enjoy these wooded rides and the beautiful scenery in the hills of Canaan Valley. More experienced bikers will get a thrill out of Timberline’s bike park, dedicated to intermediate-to-expert level biking. The park’s 21 challenging downhill singletrack trails include more than 1,000 vertical feet of drops for thrill-seeking experienced bikers. Timberline Four Seasons Resort is at 254 Four Seasons Drive, Davis, WV. While Timberline Four Seasons Resort’s address puts it in Davis, WV, the resort is actually just a few miles south of Davis in Canaan Valley. There is parking at the resort. Ticket prices are typically under $25, and range from a single ride pass to a full day pass. There are also season passes and bike rentals hourly or per day.